UNILORIN Acceptable & Unacceptable Modes of Dressing / Dress Code for Male and Female Students in University Campus. All students are hereby reminded that there is a DRESS CODE put in place by the University which must be observed at all times. The University is determined to continue to impact positively on its students not only intellectually but also morally in pursuit of its avowed commitment to the development of TOTAL MAN. To this end, it will award its degrees to only deserving students who have been found worthy not only in learning but also in character. Students are therefore strongly advised to exhibit good behaviour and dress decently at all times. beards must be well kept. all traditional and corporate wears that do not reveal sensitive parts of the body are acceptable. The mode of dressing of a student speaks volumes about him or her. In other words, one’s appearance influences people’s perception of one’s person. Students should, therefore, always dress responsibly to command respect. 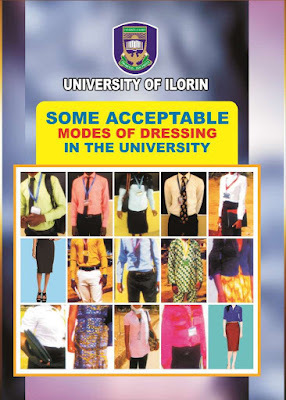 All students must refrain from wearing INDECENT CLOTHINGS, if they must be accorded respect and protect their dignity. Hair plaiting or weaving by male students. Some Faculties and Departments have prescribed Dress Codes for their students. Students in such Faculties or Departments are expected to comply with such Codes. THE WAY YOU DRESS DETERMINES THE WAY YOU ARE ADDRESSED.